Home Blood, Heart & Circulation What Is Negative Feedback Loop of Blood Pressure? In order to understand the blood pressure feedback loop, it is important to first understand what blood pressure is and what it does. Your blood pressure is how hard your heart has to pump to push the blood through your blood vessels and through your body. Any mammal that has blood in the body has a blood pressure. Blood pressure is maintained in normal ranges through a process called homeostasis, which sends out chemicals andsignals to either relax or tighten the blood vessels to make blood pressure go up or down when needed. This happens through a blood pressure feedback loop that tells the body how to maintain your blood pressure where it needs to be. If the feedback loop was to malfunction and the blood pressure doesn’t normalize, there is a higher risk for conditions such asstroke, heart attack, or even failure of the kidneys. This article explains how the feedback loop works to maintain blood pressure. 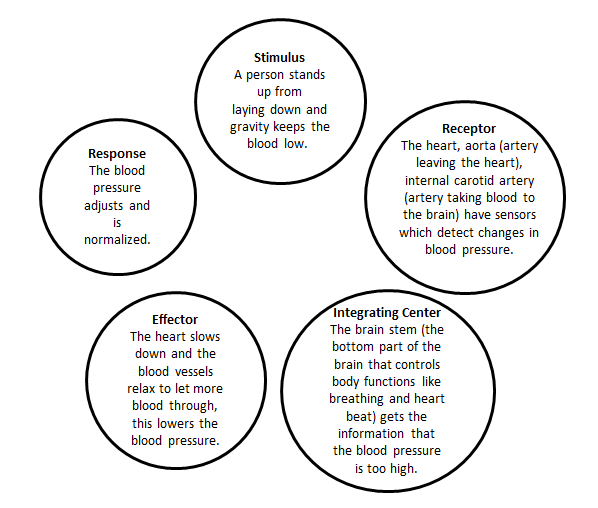 The blood pressure feedback loop helps the body maintain homeostasis. Homeostasis means all is working in harmony in the body and functioning normally. It means the body temperature is where it needs to be, the heart is beating at the right rhythm, hormones are right, and the blood pressure is in normal range. Homeostasis is disrupted when one of the key parts of the system isn’t working right or something is off. The body then goes through a series of changes to try and bring things back into balance. For example, when you get cold, you shiver to bring up your temperature. All of these responses to change the body start in the brain and gets sent out via chemicals or electrical messengers. The negative feedback loop helps to balance homeostasis by recognizing there is a problem in the body and sending out the right response. The loop stays where it is at and sends out different “effectors” to do the work. Let’s take a look at how the feedback loop works. They sense changes in your body and send a message to the integrating center. It receives messages from the sensors and decides which effector needs a signal to go out and fix the issue in the body. They are either electrical impulses or chemicals that can stabilize the body and maintain homeostasis. Negative feedback loops in the body are very stable and in themselves maintain constant conditions. This means that they are the starting point for all the other body systems. If your blood sugar goes too low, the negative feedback loop signals the liver to release glucagon and signals the pancreas to slow the production of insulin. If your blood sugar goes too high, a signal is sent to the pancreas to release more insulin to lower the blood sugar levels. This helps more glucose get absorbed into the cells and brings the blood sugar levels down. How Does Negative Feedback Loop Regulate Blood Pressure? When you do something that changes blood pressure, such asstanding up, lying down, doing exercise, or rest, these stimulates are either a raise in blood pressure or a decrease. When your blood pressure goes up or down, the receptor cells in the walls of your blood vessels can detect the changes. They send off a message to the integrating center in your brain. Otherwise known as “mission control”, it gets the message from the receptors and decides what to do, either lower or raise the blood pressure. The center then sends out a messenger to the right effectors, namely your heart or your blood vessels. These are the actual places in the body that directly control different functions. The integrating center will tell the heart to beat harder and faster or slow it down. 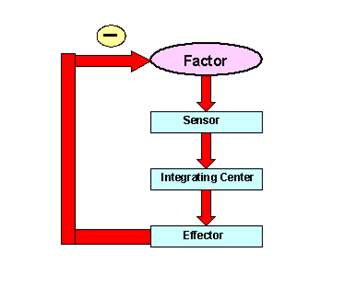 Effectors in the blood pressure feedback loop are also the blood vessels. The messages to them will be to either constrict to raise the blood pressure or relax to lower the blood pressure. Sometimes your body will get used to certain conditions and the body won’t react to changes as much. For example, if you are an athlete and your body is used to physical activity, your blood pressure may not raise much at all. You may also be able to exercise under harsher conditions and not be affected as much. This is the case in which athletes exercise in high altitudes with less oxygen. The feedback loop may not need to kick in due to good physical condition of the body. However, if the muscles do require increased oxygen levels, the feedback loop will send a message to increase the blood pressure as needed to get more blood and oxygen into the muscle. This is one example of how sophisticated this system really is.